"Armenia-Azerbaijan War" redirects here. For the war from 1918 to 1920, see Armenian–Azerbaijani War. Clockwise from top: Remnants of Azerbaijani APCs; internally displaced Azerbaijanis from the Armenian-controlled territory; Armenian T-72 tank memorial at the outskirts of Stepanakert; NKR soldiers. The Nagorno-Karabakh War (Azerbaijani: Qarabağ Müharibəsi), referred to as the Artsakh Liberation War (Armenian: Արցախյան ազատամարտ, Artsakhyan azatamart) by Armenians, was an ethnic conflict that took place in the late 1980s to May 1994, in the enclave of Nagorno-Karabakh in southwestern Azerbaijan, between the majority ethnic Armenians of Nagorno-Karabakh backed by the Republic of Armenia, and the Republic of Azerbaijan. As the war progressed, Armenia and Azerbaijan, both former Soviet Republics, entangled themselves in a protracted, undeclared war in the mountainous heights of Karabakh as Azerbaijan attempted to curb the secessionist movement in Nagorno-Karabakh. The enclave's parliament had voted in favor of uniting itself with Armenia and a referendum, boycotted by the Azerbaijani population of Nagorno-Karabakh, was held, whereby most of the voters voted in favor of independence. The demand to unify with Armenia, which began anew in 1988, began in a relatively peaceful manner; however, in the following months, as the Soviet Union's disintegration neared, it gradually grew into an increasingly violent conflict between ethnic Armenians and ethnic Azerbaijanis, resulting in claims of ethnic cleansing by both sides. The territorial ownership of Nagorno-Karabakh today is still heavily contested between Armenians and Azerbaijanis. Called Artsakh by Armenians, its history spans over two millennia, during which it came under the control of several empires. The current conflict has its roots in events following World War I. Shortly before the Ottoman Empire's capitulation in the war, the Russian Empire collapsed in November 1917 and fell under the control of the Bolsheviks. The three nations of the Caucasus, Armenians, Azerbaijanis and Georgians, previously under the rule of the Russians, declared the formation of the Transcaucasian Federation which dissolved after only three months of existence. The conflict is further challenged by ethnic differences between the majority Christian Armenians and minority Muslim Azerbaijanis. Fighting soon broke out between the First Republic of Armenia and the Azerbaijan Democratic Republic in three specific regions: Nakhchevan, Zangezur (today the Armenian province of Syunik) and Karabakh itself, in Azerbaijan. Two months later however, the Soviet 11th Army invaded the Caucasus and within three years, the Caucasian republics were formed into the Transcaucasian SFSR of the Soviet Union. The Bolsheviks thereafter created a seven-member committee, the Caucasus Bureau (typically referred to as the Kavburo). Under the supervision of the People's Commissar for Nationalities, the future Soviet ruler Joseph Stalin, the Kavburo was tasked to head up matters in the Caucasus. On 4 July 1921 the committee voted 4–3 in favor of allocating Karabakh to the newly created Soviet Socialist Republic of Armenia but a day later the Kavburo reversed its decision and voted to leave the region within Azerbaijan SSR. The Nagorno-Karabakh Autonomous Oblast (NKAO) was created in 1923, leaving it with a population that was 94% Armenian. The reversal was substantiated with the economic connections the region had with Azerbaijan. The capital was moved from Shusha to Khankendi, which was later renamed as Stepanakert. Armenian and Azeri scholars have speculated that the decision was an application of the principle of "divide and rule" by Soviet Union. This can be seen, for example, by the odd placement of the Nakhichevan exclave, which is separated by Armenia but is a part of Azerbaijan. Others have also postulated that the decision was a goodwill gesture by the Soviet government to help maintain "good relations with Atatürk's Turkey." Over the following decades of Soviet rule the Armenians retained a strong desire for unification of Nagorno-Karabakh with Armenia, an aim that some members of the Armenian Communist Party attempted to accomplish. First Secretary of the Communist Party of Armenia Aghasi Khanjian was murdered by Deputy Head (and soon Head) of the NKVD Lavrentiy Beria after submitting Armenian grievances to Stalin, which included requests to return Nagorno-Karabakh and Nakhichevan to Armenia. The Armenians insisted that their national rights had been suppressed and their cultural and economic freedoms were being curtailed. Karabakh Armenian leaders complained that the region had neither Armenian language textbooks in schools nor in television broadcasting, and that Azerbaijan's Communist Party General Secretary Heydar Aliyev had extensively attempted to "Azerify" the region and increase the influence and the number of Azeris living in Nagorno-Karabakh, while at the same time reducing its Armenian population (in 1987, Aliyev would step down as General Secretary of Azerbaijan's Politburo). By 1988, the Armenian population of Karabakh had dwindled to nearly three-quarters of the total population. The movement was spearheaded by popular Armenian figures and found support among intellectuals in Russia as well. According to journalist Thomas De Waal some members of the Russian intelligentsia, such as the dissident Andrei Sakharov expressed support for Armenians. More prominent support for the movement among the Moscow elite was interpreted by some in the public: in November 1987 L'Humanité published the personal comments made by Abel Aganbegyan, an economic adviser to Gorbachev, to Armenians living in France, in which he suggested that Nagorno-Karabakh could be ceded to Armenia. Prior to the declaration, Armenians had begun to protest and stage workers' strikes in Yerevan, demanding a unification with the enclave. This prompted Azeri counter-protests in Baku. After the demonstrations in Yerevan to demand unification of Nagorno-Karabakh with Armenia began, Gorbachev met with two leaders of the Karabakh movement, Zori Balayan and Silva Kaputikyan on 26 February 1988. Gorbachev asked them for a one-month moratorium on demonstrations. When Kaputikyan returned to Armenia the same evening, she told the crowds the "Armenians [had] triumphed" although Gorbachev hadn't made any concrete promises. According to Svante Cornell, this was an attempt to pressure Moscow. On March 10, Gorbachev stated that the borders between the republics would not change, in accordance with Article 78 of the Soviet constitution. Gorbachev also stated that several other regions in the Soviet Union were yearning for territorial changes and redrawing the boundaries in Karabakh would thus set a dangerous precedent. But the Armenians viewed the 1921 Kavburo decision with disdain and felt that in their efforts they were correcting a historical error through the principle of self-determination, a right also granted in the constitution. Azeris, on the other hand, found such calls for relinquishing their territory by the Armenians unfathomable and aligned themselves with Gorbachev's position. On 19 February 1988, during the seventh day of the Armenian rallies, the first counterprotest was held in Baku. The poet Bakhtiyar Vahabzadeh and the historian Suleyman Aliarov published an open letter in the newspaper Azerbaijan, declaring that Karabakh was historically Azerbaijani territory. Images showing burnt automobiles and marauding rioters on the streets of the industrial city of Sumgait during the pogrom there in February 1988. The clash in Askeran was the prelude to the pogroms in Sumgait, where emotions, already heightened by news about the Karabakh crisis, turned even uglier in a series of protests starting on 27 February. Speaking at the rallies, Azerbaijani refugees from the Armenian town of Ghapan accused Armenians of "murder and atrocities". According to the Soviet media, these allegations were disproved and many of the speakers were reportedly agents provocateurs. Within hours, a pogrom against Armenian residents began in Sumgait, a city some 25 kilometers north of Baku. The pogroms resulted in the deaths of 32 people (26 Armenians and 6 Azerbaijanis), according to official Soviet statistics, although many Armenians felt that the true figure was not reported. Nearly all of Sumgait's Armenian population left the city after the pogrom. Armenians were beaten, raped, mutilated and killed both on the streets of Sumgait and inside their apartments during three days of violence (with no intervention from the police or the local bodies) that only subsided when Soviet armed forces entered the city and quelled much of the rioting on 1 March. The manner in which they were killed reverberated among Armenians, recalling memories of the Armenian Genocide. On 23 March 1988 the Supreme Soviet of the Soviet Union rejected the demands of Armenians to cede Nagorno-Karabakh to Armenia. Troops were sent to Yerevan to prevent protests against the decision. Gorbachev's attempts to stabilize the region were to no avail, as both sides remained equally intransigent. In Armenia, there was a firm belief that what had taken place in the region of Nakhichevan would be repeated in Nagorno-Karabakh: prior to its absorption by Soviet Russia, it had a population which was 40% Armenian; by the late 1980s, its Armenian population was virtually non-existent. In the months following the Sumgait pogroms, a forced population exchange took place as Armenians living in Azerbaijan and Azerbaijanis living in Armenia were compelled to abandon their homes. According to the Azerbaijani government, between 27 and 29 November 1988 33 Azerbaijanis were killed in Spitak, Gugark, and Stepanavan and 216 in the 1987–1989 period. According to Azerbaijani MP Arif Yunusov in November of the same year twenty Azerbaijanis from the Armenian village of Vartan were reportedly burned to death. However, according to Armenian sources, the number of Azerbaijanis killed in the 1988–1989 period was 25. Interethnic fighting also spread throughout cities in Azerbaijan, including, in December 1988, in Kirovabad and Nakhichevan, where seven people (among them four soldiers) were killed and hundreds injured when Soviet army units attempted once more to stop attacks directed at Armenians. Estimates differ on how many people were killed during the first two years of the conflict. The Azerbaijani government alleges that 216 Azerbaijanis were killed in Armenia, while the researcher Arif Yunusov gives 127 to those killed in 1988 alone. An October 1989 piece by Time, however, stated that over 100 people were estimated to have been killed since February 1988, in both Armenia and Azerbaijan. By the end of 1988, dozens of villages in Armenia had become deserted, as most of Armenia's more than 200,000 Azerbaijanis and Muslim Kurds left. Inter-ethnic strife began to take a toll on both countries' populations, forcing most of the Armenians in Azerbaijan to flee to Armenia and most of the Azeris in Armenia to Azerbaijan. The situation in Nagorno-Karabakh had grown so out of hand that in January 1989 the central government in Moscow temporarily took control of the region, a move welcomed by many Armenians. In September 1989, Popular Front (APF) leaders and their ever-increasing supporters managed to institute a railway blockade against Armenia and the NKAO, effectively crippling Armenia's economy, as 85% of the cargo and goods arrived through rail traffic, although some claim this was a response to Armenia's embargo against Nakhichevan ASSR that had started earlier that summer. The disruption of rail service to Armenia was, accordingly, in part due to the attacks of Armenian militants on Azerbaijani train crews entering Armenia. In January 1990, another pogrom directed at Armenians in Baku forced Gorbachev to declare a state of emergency and send troops from the MVD to restore order. Amid the rising independence movement in Azerbaijan, Gorbachev dispatched the military to dragoon the events, as the Soviet regime inched closer to collapse. Soviet troops received orders to occupy Baku at midnight on January 20, 1990. City residents, who saw tanks coming at about 5 AM, said the troops were the first to open fire. The Shield Report, an independent commission from the USSR military procurator's office, rejected the military claims of returning fire, finding no evidence that those manning the barricades on the roads to Baku were armed. A curfew was established and violent clashes between the soldiers and the surging Azerbaijan Popular Front were common, in the end leading to the deaths of 120 Azerbaijanis and eight MVD soldiers in Baku. During this time, however, Azerbaijan's Communist Party had fallen and the belated order to send the MVD forces had more to do with keeping the Party in power than with protecting the city's Armenian population. The events, referred to as "Black January", also strained the relations between Azerbaijan and the central government. Azerbaijan has several exclaves within the territory of Armenia: Yukhari Askipara, Barkhudarli and Sofulu in the northwest and an exclave of Karki in the Nakhchivan exclave of Azerbaijan Republic. In early 1990, the road alongside the border village of Baganis came under routine attack by militia members from Azerbaijan. At the same time, Armenian forces attacked both these Azerbaijani enclaves within the Armenian territory and the border villages of Qazakh and Sadarak rayon in Azerbaijan proper. On 26 March 1990 several cars with Armenian paramilitaries arrived in the Armenian border village of Baganis. At dusk, they crossed the border storming the Azerbaijani village Bağanis Ayrum. About 20 houses were burned and 8 to 11 Azerbaijani villagers killed. The bodies of members of one family, including infants, were found in the charred ruins of their burned homes. By the time the Soviet Interior Ministry troops arrived in Bağanis Ayrum, the attackers had already fled. On 18 August a significant accumulation of Armenian militants near the border was observed. The following day, units of the Armenian national army bombarded Azeri villages Yuxarı Əskipara, Bağanis Ayrum, Aşağı Əskipara and Quşçu Ayrım, and according to eyewitnesses used rocket-propelled grenades and mortars. The first attack was repulsed with additional reinforcements arriving from Yerevan, Armenian forces were able to seize Yuxarı Əskipara and Bağanis Ayrum. On 20 August tanks, anti-aircraft guns and helicopter gunships of the Soviet army under the command of Major General Yuri Shatalin were brought in and by the end of the day the Armenians were driven off. According to the Soviet Ministry of Interior, one internal ministry officer and two police officers were killed, nine soldiers and thirteen residents were injured. According to Armenian media reports, five militants were killed and 25 were wounded; according to Azerbaijani media, about 30 were killed and 100 wounded. In the spring of 1991, President Gorbachev held a special countrywide referendum called the Union Treaty which would decide if the Soviet republics would remain together. Newly elected, non-communist leaders had come to power in the Soviet republics, including Boris Yeltsin in Russia (Gorbachev remained the President of the Soviet Union), Levon Ter-Petrosyan in Armenia, and Ayaz Mutalibov in Azerbaijan. Armenia and five other republics boycotted the referendum (Armenia would hold its own referendum and declared its independence from the Soviet Union on 21 September 1991), whereas Azerbaijan voted in compliance to the Treaty. As many Armenians and Azeris in Karabakh began an arms build up (by acquiring weaponry located in caches throughout Karabakh) in order to defend themselves, Mutalibov turned to Gorbachev for support in launching a joint military operation in order to disarm Armenian militants in the region. Termed Operation Ring, Soviet forces acting in conjunction with the local Azerbaijani OMON forcibly deported Armenians living in the villages of the region of Shahumyan. The operation involved the use of ground troops, military, armored vehicles and artillery. The deportations of the Armenian civilians were carried out with gross human rights violations documented by international human rights organizations. First peace mediation efforts were started by the Russian President, Boris Yeltsin and Kazakhstan President, Nursultan Nazarbayev in September 1991. After peace talks in Baku, Ganja, Stepanakert (Khankendi) and Yerevan on 20–23 September, the sides agreed to sign the Zheleznovodsk Communiqué in the Russian city of Zheleznovodsk taking the principles of territorial integrity, non-interference in internal affairs of sovereign states, observance of civil rights as a base of the agreement. The agreement was signed by Yeltsin, Nazarbayev, Mutalibov, and Ter-Petrosian. The peace efforts came to a halt due to continuing bombardment and atrocities by Azerbaijani OMON in Stepanakert and Chapar in late September. With the final blow being the Azerbaijani MI-8 helicopter shoot down near the village of Karakend in the Martuni District with peace mediating team consisting of Russian, Kazakh observers and Azerbaijani high-ranking officials on board. Starting in late autumn of 1991, when the Azerbaijani side started its counter-offensive, the Armenian side began targeting Azerbaijani villages. According to Memorial, the villages Malibeyli and Gushchular, from which Azeri forces regularly bombarded Stepanakert, were attacked by Armenians where the houses were burned and dozens of civilians were killed. Each side accused the other of using the villages as strategic gathering points, covering the artillery positions. On 19 December, Internal Ministry troops began to withdraw from Nagorno-Karabakh, which was completed by 27 December. With the collapse of the Soviet Union and the withdrawal of internal troops from Nagorno-Karabakh, the situation in the conflict zone became uncontrollable. As the disintegration of the Soviet Union became a reality for Soviet citizens in the autumn of 1991, both sides sought to acquire weaponry from military caches located throughout Karabakh. The initial advantage tilted in Azerbaijan's favor. During the Cold War, the Soviet military doctrine for defending the Caucasus had outlined a strategy where Armenia would be a combat zone in the event that NATO member Turkey were to have invaded from the west. Thus, there were only three divisions stationed in the Armenian SSR and no airfields, while Azerbaijan had a total of five divisions and five military airfields. Furthermore, Armenia had approximately 500 railroad cars of ammunition in comparison to Azerbaijan's 10,000. Most weaponry was Russian-made or came from the former Eastern bloc countries; however, some improvisation was made by both sides. Azerbaijan received substantial military aid and provisions from Turkey, Israel and numerous Arab countries. The Armenian Diaspora donated a significant amount of aid to Armenia through the course of the war and even managed to push for legislation in the United States Congress to pass a bill entitled Section 907 of the Freedom Support Act in response to Azerbaijan's blockade against Armenia, placing a complete ban on military aid from the United States to Azerbaijan in 1992. While Azerbaijan charged that the Russians were initially helping the Armenians, it was said that "the Azeri fighters in the region [were] far better equipped with Soviet military weaponry than their opponents." Armenian soldiers in Karabakh, early 1990s. The sporadic battles between Armenians and Azeris had intensified after Operation Ring recruited thousands of volunteers into improvised armies from both Armenia and Azerbaijan. In Armenia, a recurrent and popular theme at the time compared and idolized the separatist fighters to historical Armenian guerrilla groups and revered individuals such as Andranik Ozanian and Garegin Nzhdeh, who fought against the Ottoman Empire during the late nineteenth and early twentieth centuries. In addition to the government's conscription of males aged 18–45, many Armenians volunteered to fight and formed jokats, or detachments of about forty men, which, combined with several others, came under the command of a Lieutenant Colonel. Initially, many of these men chose when and where to serve and acted on their own behalf, rarely with any oversight, when attacking or defending areas. Direct insubordination was common as many of the men simply did not show up, looted the bodies of dead soldiers and commodities such as diesel oil for armored vehicles disappeared only to be sold in black markets. Azerbaijan's military functioned in much the same manner; however, it was better organized during the first years of the war. The Azeri government also carried out conscription and many Azeris enthusiastically enlisted for combat in the first months after the Soviet Union collapsed. Azerbaijan's National Army consisted of roughly 30,000 men, in addition to nearly 10,000 in its OMON paramilitary force and several thousand volunteers from the Popular Front. Suret Huseynov, a wealthy Azeri, also improvised by creating his own military brigade, the 709th of the Azerbaijani Army and purchasing many weapons and vehicles from the 23rd Motor Rifle Division's arsenal. İsgandar Hamidov's bozqurt or Grey Wolves brigade also mobilized for action. The government of Azerbaijan also poured a great deal of money into hiring mercenaries from other countries through the revenue it was making from its oil field assets on and near the Caspian Sea. In an overall military comparison, the number of men eligible for military service in Armenia, in the age group of 17–32, totalled 550,000, while in Azerbaijan it was 1.3 million. Most men from both sides had served in the Soviet Army and so had some form of military experience prior to the conflict, including tours of duty in Afghanistan. Among Karabakh Armenians, about 60% had served in the Soviet Army. Most Azeris, however, were often subject to discrimination during their service in the Soviet military and relegated to work in construction battalions rather than fighting corps. Despite the establishment of two officer academies including a naval school in Azerbaijan, the lack of such military experience was one factor that rendered Azerbaijan unprepared for the war. The Azerbaijani military was assisted by Afghan commander Gulbuddin Hekmatyar. The recruitment for the purpose was mostly made in Peshawar by commander Fazle Haq Mujahid and several groups were dispatched to Azerbaijan for different duties. On 2 January 1992 Ayaz Mutalibov assumed the office of the presidency of Azerbaijan. Officially, the newly created Republic of Armenia publicly denied any involvement in providing any weapons, fuel, food, or other logistics to the secessionists in Nagorno-Karabakh. However, Ter-Petrosyan later did admit to supplying them with logistical supplies and paying the salaries of the separatists, but denied sending any of its own men to combat. Armenia faced a debilitating blockade by the now Republic of Azerbaijan, as well as pressure from neighboring Turkey, which decided to side with Azerbaijan and build a closer relationship with it. In early February, the Azeri villages of Malıbəyli, Karadagly and Agdaban were conquered and their population evicted, leading to at least 99 civilian deaths and 140 wounded. The only land connection Armenia had with Karabakh was through the narrow mountainous Lachin corridor which could only be reached by helicopters. The region's only airport was in the small town of Khojaly, which was seven km (4.3 miles) north of capital Stepanakert with an estimated population of 6,000–10,000 people. Additionally, Khojaly had been serving as an artillery base from which GRAD missiles were launched upon the civilian population of capital Stepanakert: On some days as many as 400 GRAD missiles rained down on Armenian multi- storey apartments. By late February, the Armenian forces reportedly warned about the upcoming attack and issued an ultimatum that unless the Azerbaijanis stopped the shelling from Khojaly they would seize the town. By late February, Khojaly had largely been cut off. On 26 February, Armenian forces, with the aid of some armored vehicles from the 366th, mounted an offensive to capture Khojaly. According to the Azerbaijani side and the affirmation of other sources including Human Rights Watch, the Moscow-based human rights organization Memorial and the biography of a leading Armenian commander, Monte Melkonian, documented and published by his brother, after Armenian forces captured Khojaly, they proceeded to kill several hundred civilians evacuating from the town. Armenian forces had previously stated they would attack the city and leave a land corridor for them to escape through. However, when the attack began, the attacking Armenian force easily outnumbered and overwhelmed the defenders who along with the civilians attempted to retreat north to the Azeri held city of Agdam. The airport's runway was found to have been intentionally destroyed, rendering it temporarily useless. The attacking forces then went on to pursue those fleeing through the corridor and opened fire upon them, killing scores of civilians. Facing charges of an intentional massacre of civilians by international groups, Armenian government officials denied the occurrence of a massacre and asserted an objective of silencing the artillery coming from Khojaly. An exact body count was never ascertained but conservative estimates have placed the number to 485. The official death toll according to Azerbaijani authorities for casualties suffered during the events of 25–26 February is 613 civilians, of them 106 women and 83 children. On 3 March 1992, the Boston Globe reported over 1,000 people had been slain over four years of conflict. It quoted the mayor of Khojaly, Elmar Mamedov, as also saying 200 more were missing, 300 were held hostage and 200 injured in the fighting. A report published in 1992 by the human rights organization Helsinki Watch however stated that their inquiry found that the Azerbaijani OMON and "the militia, still in uniform and some still carrying their guns, were interspersed with the masses of civilians" which may have been the reason why Armenian troops fired upon them. When Armenians launched one of the first offensives, at Stepanakert on 13 February 1988, many Azerbaijanis fled to the stronghold of Shusha. On 28 March, Azerbaijani troops deployed to attack Stepanakert, attacked enemy positions above the village Kirkidzhan from the village of Dzhangasan. During the afternoon of the next day, Azerbaijani units took up positions in close proximity to the city, but were quickly repulsed by the Armenians. In the ensuing months after the capture of Khojaly, Azeri commanders holding out in the region's last bastion of Shusha began a large-scale artillery bombardment with GRAD rocket launchers against Stepanakert. By April, the shelling had forced many of the 50,000 people living in Stepanakert to seek refuge in underground bunkers and basements. Facing ground incursions near the city's outlying areas, military leaders in Nagorno-Karabakh organized an offensive to take the town. On 8 May a force of several hundred Armenian troops accompanied by tanks and helicopters attacked the Azeri citadel of Shusha. Fierce fighting took place in the town's streets and several hundred men were killed on both sides. Although the Armenians were outnumbered and outgunned by the Azeri army, they managed to capture the town and force the Azeris to retreat on 9 May. The capture of Shusha resonated loudly in neighboring Turkey. Its relations with Armenia had grown better after it had declared its independence from the Soviet Union; however, they gradually worsened as a result of Armenia's gains in the Nagorno-Karabakh region. Turkey's prime minister, Suleyman Demirel said that he was under intense pressure by his people to have his country intervene and aid Azerbaijan. Demirel, however, was opposed to such an intervention, saying that Turkey's entrance into the war would trigger an even greater Muslim-Christian conflict (Turks are overwhelmingly Muslims). A Chechen contingent, led by Shamil Basayev, was one of the units to participate in the conflict. According to Azeri Colonel Azer Rustamov, in 1992, "hundreds of Chechen volunteers rendered us invaluable help in these battles led by Shamil Basayev and Salman Raduev." Basayev was said to be one of the last fighters to leave Shusha. According to Russian news reports Basayev later said during his career, he and his battalion had only lost once and that defeat came in Karabakh in fighting against the "Dashnak battalion." He later said he pulled his forces out of the conflict because the war seemed to be more for nationalism than for religion. Basayev received direct military training from the Russian GRU during the War in Abkhazia (1992–1993) since the Abkhaz were backed by Russia. Other Chechens also were trained by the GRU in warfare, many of these Chechens who fought for the Russians in Abkhazia against Georgia had fought for Azerbaijan against Armenia in the Nagorno-Karabakh war. The loss of Shusha led the Azeri parliament to lay the blame on Yaqub Mammadov, then acting President of Azerbaijan, which removed him from power and cleared Mutalibov of any responsibility after the loss of Khojaly, reinstating him as President on 15 May 1992. Many Azeris saw this act as a coup in addition to the cancellation of the parliamentary elections slated in June of that year. The Azeri parliament at that time was made up of former leaders from the country's communist regime and the losses of Khojaly and Shusha only aggrandized their desires for free elections. To contribute to the turmoil, an offensive was launched by Armenian forces on 18 May to take the city of Lachin in the narrow corridor separating Armenia and Nagorno-Karabakh. The city itself was poorly guarded and, within the next day, Armenian forces took control of the town and cleared any remaining Azeris to open the road that linked the region to Armenia. The taking of the city then allowed an overland route to be connected with Armenia itself with supply convoys beginning to trek up the mountainous region of Lachin to Karabakh. The loss of Lachin was the final blow to Mutalibov's regime. Demonstrations were held despite Mutalibov's ban and an armed coup was staged by Popular Front activists. Fighting between government forces and Popular Front supporters escalated as the political opposition seized the parliament building in Baku as well as the airport and presidential office. On 16 June 1992 Abulfaz Elchibey was elected leader of Azerbaijan with many political leaders from the Azerbaijan Popular Front Party were elected into the parliament. The instigators characterized Mutalibov as an undedicated and weak leader in the war in Karabakh. Elchibey was staunchly against receiving any help from the Russians, instead favoring closer ties to Turkey. Operation Goranboy was a large-scale Azerbaijani offensive in the summer of 1992 aimed at taking control over the entire Nagorno-Karabakh and putting a decisive end to the resistance. This offensive is regarded as the only successful breakthrough by the Azeri Army and marks the peak of Azerbaraijani success in the entirety of the six-year-long conflict. It also marks the beginning of a new, more intense, phase of the war. Over 8,000 Azeri troops and four additional battalions, at least 90 tanks and 70 Infantry fighting vehicles, as well as Mi-24 attack-helicopters were used in this operation. On 12 June 1992, the Azerbaijani military launched a large-scale diversionary attack in the direction of the Askeran region at the center of Nagorno-Karabakh. Two groups, numbering 4,000 men, attacked the positions to the north and south of Askeran. As a result of fierce fighting the Azeris managed to establish control over some settlements in the Askeran region: Nakhichevanik, Arachadzor, Pirdzhamal, Dahraz and Agbulak. On 13 June 1992, Azerbaijan launched its main offensive against the region of Goranboy, located north of Nagorno-Karabakh, which was defended by just two small and poorly-equipped Armenian voluntary detachments. This three-day offensive was code-named Operation Goranboy and commanded by Suret Huseynov. After fifteen hours of fierce fighting against Azerbaijani forces, the two Armenian detachments were forced to retreat. Azerbaijan managed to capture several dozen villages in the Goranboy region originally held by the Armenian forces, and the entire Armenian civilian population of this region fled. On 4 July 1992, the Azeris captured the largest town in the region, Mardakert. A destroyed BRDM-2 in Dashalty. The scale of the Azeri offensive prompted the Armenian government to threaten Azerbaijan that it would directly intervene and assist the separatists fighting in Karabakh. The assault forced Armenian forces to retreat south toward Stepanakert where Karabakh commanders contemplated destroying a vital hydroelectric dam in the Martakert region if the offensive was not halted. An estimated 30,000 Armenian refugees were also forced to flee to the capital as the assaulting forces had taken nearly half of Nagorno-Karabakh. The Azeri thrust ground to a halt when the armor was driven off by helicopter gunships. It was claimed that many of the crew members of the armored units in the Azeri launched assault were Russians from the 104th Guards Airborne Division, based out of Ganja and, ironically enough, so were the units that eventually stopped them. According to an Armenian government official, they were able to persuade Russian military units to bombard and effectively halt the advance within a few days. Russia also supplied arms to the Armenians. This allowed the Armenian government to make up its losses and reorganize a counteroffensive to restore the original lines of the front. Given the reorganization of the NKR Defense Army, the tide of Azeri advances was finally stemmed. By the autumn of 1992, the Azerbaijani army was exhausted and had suffered heavy losses. Faced with imminent defeat, Suret Huseynov moved what was left of his army out of Aghdara and back to Ganja, where it could recuperate and restock on ammunition and armaments found at the 104th Guards Airborne Division's base. In February–March of the following year, the NKR Defense Army helped turn the tide into an unprecedented wave of advances. New efforts at peace talks were initiated by Iranian President Akbar Hashemi Rafsanjani in the first half of 1992, after the events in Khojaly and the resignation of Azeri President Ayaz Mutallibov. Iranian diplomats conducted shuttle diplomacy and were able to bring the new president of Azerbaijan Yaqub Mammadov and President of Armenia Levon Ter-Petrosian to Tehran for bilateral talks on 7 May 1992. The Tehran Communiqué was signed by Mammadov, Ter-Petrosian, and Rafsanjani following the agreement of the parties to international legal norms, stability of borders and to deal with the refugee crisis. However, the peace efforts were disrupted on the next day when Armenian troops captured the town of Shusha and completely failed following the capture of the town Lachin on 18 May. In the summer of 1992, the CSCE (later to become the Organization for Security and Co-operation in Europe), created the Minsk Group in Helsinki which comprised eleven nations and was co-chaired by France, Russia, and the United States with the purpose of mediating a peace deal with Armenia and Azerbaijan. However, in their annual summit in 1992, the organization failed to address and solve the many new problems that had arisen since the Soviet Union collapsed, much less the Karabakh conflict. 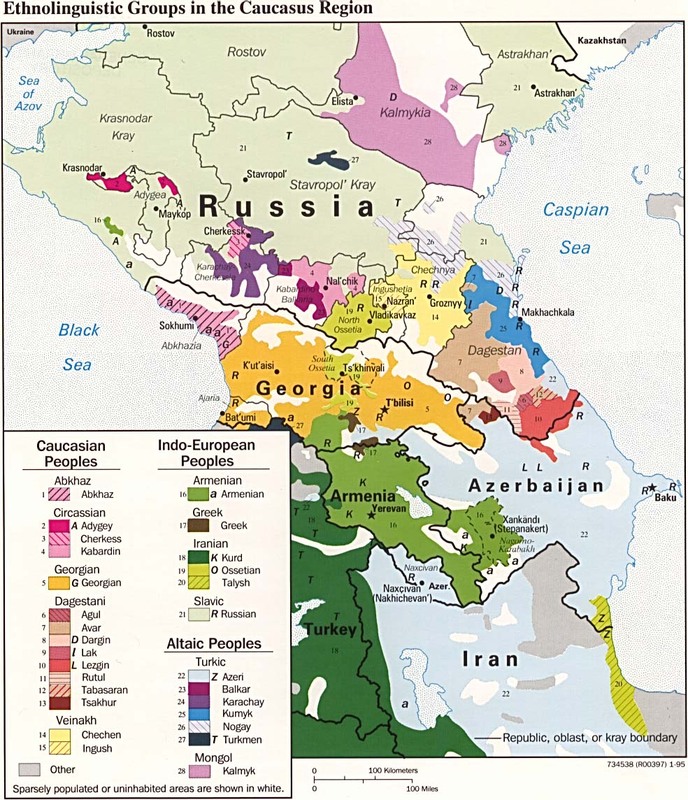 The war in Yugoslavia, Moldova's war with the breakaway republic of Transnistria, the secessionist movement in Chechnya, and Georgia's renewed disputes with Russia, Abkhazia, and Ossetia were all top agenda issues that involved various ethnic groups fighting each other. The CSCE proposed the use of NATO and CIS peacekeepers to monitor ceasefires and protect shipments of humanitarian aid being sent to displaced refugees. Several ceasefires were put into effect after the June offensive but the implementation of a European peacekeeping force, endorsed by Armenia, never came to fruition. The idea of sending 100 international observers to Karabakh was once raised but talks broke down completely between Armenian and Azeri leaders in July. Russia was especially opposed to allowing a multinational peacekeeping force from NATO to entering the Caucasus, seeing it as a move that encroached on its "backyard". In late June, a new, smaller Azeri offensive was planned, this time against the town of Martuni in the southeastern half of Karabakh. The attack force consisted of several dozen tanks and armored fighting vehicles along with a complement of several infantry companies massing along the Machkalashen and Jardar fronts near Martuni and Krasnyy Bazar. Martuni's regimental commander, Monte Melkonian, referred now by his men as "Avo", although lacking heavy armor, managed to stave off repeated attempts by the Azeri forces. In late August 1992, Nagorno-Karabakh's government found itself in a disorderly state and its members resigned on 17 August. Power was subsequently assumed by a council called the State Defense Committee and chaired by Robert Kocharyan, which stated it would temporarily govern the enclave until the conflict ended. At the same time, Azerbaijan also launched attacks by fixed-wing aircraft, often bombing civilian targets. Kocharyan condemned what he believed were intentional attempts to kill civilians by the Azeris and also Russia's alleged passive and unconcerned attitude toward allowing its army's weapons stockpiles to be sold or transferred to Azerbaijan. Experiencing both food shortages and power shortages, after the shutting down of the Metsamor nuclear power plant, Armenia's economic outlook appeared bleak: in Georgia, a new bout of civil wars against separatists in Abkhazia and Ossetia began, and supply convoys were raided and the only oil pipeline leading from Russia to Armenia repeatedly destroyed. Similar to the winter of 1991–1992, the 1992–1993 winter was especially cold, as many families throughout Armenia and Karabakh were left without heating and hot water. Grain had become difficult to procure. The Armenian Diaspora raised money and donated supplies to Armenia. In December, two shipments of 33,000 tons of grain and 150 tons of infant formula arrived from the United States via the Black Sea port of Batumi, Georgia. In February 1993, the European Community sent 4.5 million ECUs to Armenia. Armenia's southern neighbor Iran also helped Armenia economically by providing power and electricity. Elchibey's acrimonious stance toward Iran and his remarks to unify with Iran's Azeri minority alienated relations between the two countries. Azeris displaced as internal and international refugees were forced to live in makeshift camps provided by both the Azerbaijan government and Iran. The International Red Cross also distributed blankets to the Azeris and noted that by December, enough food was being allocated for the refugees. Azerbaijan also struggled to rehabilitate its petroleum industry, the country's chief export. Its oil refineries were not generating at full capacity and production quotas fell well short of estimates. In 1965, the oil fields in Baku were producing 21.5 million tons of oil annually; by 1988, that number had dropped down to almost 3.3 million. Outdated Soviet refinery equipment and a reluctance by Western oil companies to invest in a war region where pipelines would routinely be destroyed prevented Azerbaijan from fully exploiting its oil wealth. Despite the grueling winter, the new year was viewed enthusiastically by both sides. Azerbaijan's President Elchibey expressed optimism toward bringing an agreeable solution to the conflict with Armenia's Ter-Petrosyan. Glimmers of such hope, however, quickly began to fade in January 1993, despite the calls for a new ceasefire by Boris Yeltsin and George H. W. Bush, as hostilities in the region brewed up once more. Armenian forces began a new bout of offensives that overran villages in northern Karabakh that had been held by the Azeris since the previous autumn. Frustration over these military defeats took a toll on the domestic front in Azerbaijan. Azerbaijan's military had grown more desperate and defense minister Gaziev and Huseynov's brigade turned to Russian help, a move which ran against Elchibey's policies and were construed as insubordination. Political infighting and arguments on where to shift military units between the country's ministry of the interior İsgandar Hamidov and Gaziev led to the latter's resignation on 20 February. Armenia was similarly wracked by political turmoil and growing Armenian dissension against President Ter-Petrosyan. An Armenian engineer repairing a captured Azeri tank. Note the crescent emblem on the turret of the tank. Situated west of northern Karabakh, outside the official boundaries of the region, was the rayon of Kelbajar, which bordered Armenia. With a population of about 60,000, the several dozen villages were made up of Azeris and Kurds. In March 1993, the Armenian-held areas near the Sarsang reservoir in Mardakert were reported to have been coming under attack by the Azeris. After successfully defending the Martuni region, Melkonian's fighters were tasked to move to capture the region of Kelbajar, where the incursions and artillery shelling were said to have been coming from. Scant military opposition by the Azeris allowed Melkonian's fighters to gain a foothold in the region and along the way capture several abandoned armored vehicles and tanks. At 2:45 pm, on 2 April, Armenian forces from two directions advanced toward Kelbajar in an attack that struck Azerbaijani armor and troops entrenched near the Ganje-Kelbjar intersection. Azerbaijani forces were unable to halt the advances made by Armenian armor and were wiped out completely. The second attack toward Kelbajar also quickly overran the defenders. By 3 April, Armenian forces were in possession of Kelbajar. President Elchibey imposed a state of emergency for a period of two months and introduced universal conscription. On 4 July artillery bombardment commenced against Agdam by Armenian forces, destroying many parts of the town. Soldiers, along with civilians, began to evacuate Agdam. Facing military collapse, Aliev attempted to mediate with the de facto Karabakh government and Minsk Group officials. In mid-August, Armenians massed a force to take the Azerbaijani-held regions of Fizuli and Jebrail, south of Nagorno-Karabakh proper. By early September, Azerbaijani forces were nearly in complete disarray. Many of the heavy weapons they had received and bought from the Russians had been taken out of action or abandoned during the battles. Since the June 1992 offensive, Armenian forces had captured dozens of tanks, light armor, and artillery from Azerbaijan. For example, according to Monte Melkonian in a television interview in March 1993, his forces in Martuni alone had captured or destroyed a total of 55 T-72s, 24 BMP-2s, 15 APCs and 25 pieces of heavy artillery since the June 1992 Goranboy offensive. "Most of our arms," he stated, "[were] captured from Azerbaijan." Serzh Sargsyan, the then military leader of the Karabakh armed forces, tallied a total of 156 tanks captured through the course of the war. By the summer of 1993, Armenian forces had captured so much equipment that many of them were praising Elchibey, since he was, in effect, arming both sides. Further signs of Azerbaijan's desperation included the recruitment by Aliyev of 1,000–1,500 Afghan and Arab mujahadeen fighters from Afghanistan. Although the Azerbaijani government denied this claim, correspondence and photographs captured by Armenian forces indicated otherwise. Other sources of foreign help arrived from Pakistan and also Chechnya including guerilla fighter Shamil Basayev. A United States-based petroleum company, MEGA OIL, also hired several American military trainers as a prerequisite for Azerbaijan to grant it drilling rights at its oil fields. The aerial warfare in Karabakh involved primarily fighter jets and attack helicopters. The primary transport helicopters of the war were the Mi-8 and its cousin, the Mi-17 and were used extensively by both sides. Armenia's active air force consisted of only two Su-25 ground support bombers, one of which was lost due to friendly fire. There were also several Su-22s and Su-17s; however, these aging craft took a backseat for the duration of the war. In total, throughout the war Armenians brought down 28 Azerbaijani warplanes and 19 military helicopters. Azerbaijan's air force was composed of forty-five combat aircraft which were often piloted by experienced Russian and Ukrainian mercenaries from the former Soviet military. They flew mission sorties over Karabakh with such sophisticated jets as the MiG-25 and Sukhoi Su-24 and with older-generation Soviet fighter bombers, such as the MiG-21. They were reported to have been paid a monthly salary of over 5,000 rubles and flew bombing campaigns from air force bases in Azerbaijan often targeting Stepanakert. These pilots, like the men from the Soviet interior forces in the onset of the conflict, were also poor and took the jobs as a means of supporting their families. Several were shot down over the city by Armenian forces and according to one of the pilots' commanders, with assistance provided by the Russians. Many of these pilots faced the threat of execution by Armenian forces if they were shot down. The setup of the defense system severely hampered Azerbaijan's ability to carry out and launch more air strikes. The most widely used helicopter gunship by both the Armenians and Azeris was the Soviet-made Mil Mi-24 Krokodil. The final borders of the conflict after the 1994 ceasefire was signed. Armenian forces of Nagorno-Karabakh currently control almost 9% of Azerbaijan's territory outside the former Nagorno-Karabakh Autonomous Oblast. Azerbaijani forces, on the other hand, control Shahumian and the eastern parts of Martakert and Martuni. In October 1993, Aliev was formally elected president and promised to bring social order to the country in addition to recapturing the lost regions. In October, Azerbaijan joined the CIS. The winter season was marked with similar conditions as in the previous year, both sides scavenging for wood and harvesting foodstuffs months in advance. Two subsequent UNSC resolutions on the Nagorno-Karabakh conflict were passed, (874 and 884), in October and November and, although reemphasizing the same points as the previous two, they acknowledged Nagorno-Karabakh as a party to the conflict. In early January, Azerbaijani forces and Afghan guerrillas recaptured part of the Fizuli district, including the railway junction of Horadiz on the Iranian border, but failed to recapture the town of Fizuli itself. On 10 January 1994 an offensive was launched by Azerbaijan toward the region of Martakert in an attempt to recapture the northern section of the enclave. The offensive managed to advance and take back several parts of Karabakh in the north and to the south but soon petered out. In response, the Republic of Armenia began sending conscripts and regular Army and Interior Ministry troops to stop the Azerbaijani advance in Karabakh. To bolster the ranks of its army, the Armenian government issued a decree that instituted a three-month call-up for men up to age forty-five and resorted to press-gang raids to enlist recruits. Several active-duty Armenian Army soldiers were captured by the Azerbaijani forces. Azerbaijan's offensives grew more desperate as boys as young as 16, with little to no training, were recruited and sent to take part in ineffective human wave attacks (a tactic often compared to the one employed by Iran during the Iran–Iraq War). The two offensives that took place in the winter cost Azerbaijan as many as 5,000 lives (at the loss of several hundred Armenians). The main Azeri offensive was aimed at recapturing the Kelbajar district, which would thus threaten the Lachin corridor. The attack initially met little resistance and was successful in capturing the vital Omar Pass. However, as the Armenian forces reacted, the bloodiest clashes of the war ensued and the Azeri forces were soundly defeated. In a single episode of that time's clashes, Azerbaijan lost about fifteen hundred of its soldiers after the failed offensive in Kelbajar. Several Azeri brigades were isolated when the Armenians recaptured the Omar Pass, surrounded, then destroyed. While the political leadership changed hands several times in Azerbaijan, most Armenian soldiers in Karabakh claimed that the Azeri youth, and Azeris themselves, were demoralized and lacked a sense of purpose and commitment to fighting the war. Russian professor Georgiy I. Mirsky lent credence to this view in his 1997 book, On Ruins of Empire, stating that "Karabakh does not matter to Azerbaijanis as much as it does to Armenians. Probably, this is why young volunteers from Armenia proper have been much more eager to fight and die for Karabakh than the Azerbaijanis have." This view received further validation in a report filed by a journalist from the New York Times visiting the region, who noted that "In Stepanakert, it is impossible to find an able-bodied man – whether volunteer from Armenia or local resident – out of uniform. [Whereas in] Azerbaijan, draft-age men hang out in cafes." Andrei Sakharov famously remarked on this at the outset of the conflict: "For Azerbaijan the issue of Karabakh is a matter of ambition, for the Armenians of Karabakh, it is a matter of life or death." The graves of Azerbaijani soldiers in Baku. The graves of Armenian soldiers in Stepanakert. After six years of intense fighting, both sides were ready for a ceasefire. Azerbaijan, with its manpower exhausted and aware that Armenian forces had an unimpeded path to march on to Baku, counted on a new ceasefire proposal from either the CSCE or Russia. As the final battles of the conflict took place near Shahumyan, in a series of brief engagements in Gulustan, Armenian and Azerbaijani diplomats met in the early part of 1994 to hammer out the details of the ceasefire. On May 5, with Russia acting as a mediator, all parties agreed to cease hostilities and vowed to observe a ceasefire that would go into effect at 12:01 AM on May 12. The agreement was signed by the respective defense ministers of the three principle warring parties (Armenia, Azerbaijan, and the Nagorno-Karabakh Republic). In Azerbaijan, many welcomed the end of hostilities. Sporadic fighting continued in some parts of the region but all sides vowed to abide by the terms of the ceasefire. Today, the Nagorno-Karabakh conflict remains one of several frozen conflicts in the former Soviet Union, alongside Georgia's breakaway regions of Abkhazia and South Ossetia and Moldova's troubles with Transnistria. Karabakh remains under the jurisdiction of the government of the unrecognized but de facto independent Republic of Nagorno-Karabakh, which maintains its own uniformed military, the Nagorno-Karabakh Defense Army. Contrary to media reports that nearly always mentioned the religions of the Armenians and Azeris religious aspects never gained significance as an additional casus belli, and the Karabakh conflict has remained primarily an issue of territory and the human rights of Armenians in Karabakh. Since 1995, the co-chairs of the OSCE Minsk Group has been mediating with the governments of Armenia and Azerbaijan to settle for a new solution. Numerous proposals have been made which have primarily been based on both sides making several concessions. One such proposal stipulated that as Armenian forces withdrew from the seven regions surrounding Karabakh, Azerbaijan would share some of its economic assets including profits from an oil pipeline that would go from Baku through Armenia to Turkey. Other proposals also included that Azerbaijan would provide the broadest form of autonomy to Karabakh next to granting it full independence. Armenia has also been pressured by being excluded from major economic projects throughout the region, including the Baku-Tbilisi-Ceyhan pipeline and Kars-Tbilisi-Baku railway. According to Armenia's former president, Levon Ter-Petrosyan, by giving certain Karabakh territories to Azerbaijan, the Karabakh conflict would have been resolved in 1997. A peace agreement could have been concluded and a status for Nagorno-Karabakh would have been determined. Ter-Petrosyan noted years later that the Karabakh leadership approach was maximalist and "they thought they could get more." Most autonomy proposals have been rejected, however, by the Armenians, who consider it as a matter that is not negotiable. Likewise, Azerbaijan has also refused to let the matter subside and regularly threatens to resume hostilities. On 30 March 1998, Robert Kocharyan was elected president and continued to reject calls for making a deal to resolve the conflict. In 2001, Kocharyan and Aliyev met in Key West, Florida for peace talks sponsored by the Organization for Security and Cooperation in Europe. While several Western diplomats expressed optimism, failure to prepare the populations of either country for compromise reportedly thwarted hopes for a peaceful resolution. Refugees displaced from the fighting amount to nearly one million people. An estimated 400,000 Armenians living in Azerbaijan fled to Armenia or Russia and a further 30,000 came from Karabakh. Many of those who left Karabakh returned after the war ended. An estimated 800,000 Azeris were displaced from the fighting including those from both Armenia and Karabakh. Various other ethnic groups living in Karabakh were also forced to live in refugee camps built by both the Azeri and Iranian governments. Although Azerbaijan has repeatedly claimed that 20% of its territory has fallen under Armenian control and other sources have given figures as high 40%, the actual percentage, taking into account the exclave of Nakhichevan, is estimated to be closer to 13.62% or 14% (the number comes down to 9% if Nagorno-Karabakh itself is excluded). The Nagorno-Karabakh war has given rise to strong Anti-Armenianism in Azerbaijan and Anti-Azerbaijani sentiment in Armenia. The ramifications of the war were said to have played a part in the February 2004 murder of Armenian Lieutenant Gurgen Markaryan who was hacked to death with an axe by his Azerbaijani counterpart, Ramil Safarov at a NATO training seminar in Budapest, Hungary. Upon his extradition in 2012 Safarov was pardoned by president Aliyev and greeted as a hero in Azerbaijan. Azerbaijani enmity against anything Armenian led to the destruction of thousands of medieval Armenian gravestones, known as khachkars, at a massive cemetery in Julfa, Nakhichevan. This destruction was temporarily halted when first revealed in 1998, but then continued on to completion in 2005. Azerbaijan has likened Armenia's control of the region to the Nazi occupation of the Soviet Union during World War II. In the years since the end of the war, a number of organizations have passed resolutions regarding the conflict. On 25 January 2005, for example, PACE adopted a controversial non-binding resolution, Resolution 1416, which criticized the "large-scale ethnic expulsion and the creation of mono-ethnic areas" and declared that Armenian forces were occupying Azerbaijan lands. On 14 May 2008 thirty-nine countries from the United Nations General Assembly adopted Resolution 62/243 which called for "the immediate, complete and unconditional withdrawal of all Armenian forces from all occupied territories of the Republic of Azerbaijan." Almost one hundred countries, however, abstained from voting while seven countries, including the three co-chairs of the Minsk Group, Russia, the United States, and France, voted against it. During the summit of the Organisation of the Islamic Conference (OIC) and the session of its Council of Ministers of Foreign Affairs, member states adopted OIC Resolution № 10/11 and OIC Council of Foreign Ministers Resolution № 10/37, on 14 March 2008 and 18–20 May 2010, respectively. Both resolutions condemned alleged aggression of Armenia against Azerbaijan and called for immediate implementation of UN Security Council Resolutions 822, 853, 874 and 884. As a response, Armenian leaders have stated Azerbaijan was "exploiting Islam to muster greater international support." In early 2008, tensions between Armenia, the NKR Karabakh and Azerbaijan grew. On the diplomatic front, President Ilham Aliyev once again repeated statements that Azerbaijan would resort to force, if necessary, to take the territories back; concurrently, shooting incidents along the line of contact increased. The most significant breach of the ceasefire occurred on 5 March 2008, when up to sixteen soldiers were killed. Both sides accused the other of starting the battle. Moreover, the use of artillery in the recent skirmishes marks a significant departure from previous clashes, which usually involved only sniper or machine gun fire. Deadly skirmishes took place during the summer of 2010 as well. In 2008, the Moscow Defense Brief opined that because of the rapid growth of Azeri defense expenditures – which is driving the strong rearmament of the Azeri armed forces – the military balance appeared to be now shifting in Azerbaijan's favor: "...The overall trend is clearly in Azerbaijan's favor, and it seems that Armenia will not be able to sustain an arms race with Azerbaijan's oil-fueled economy. And this could lead to the destabilization of the frozen conflict between these two states," the journal wrote. Other analysts have made more cautious observations, noting that administrative and military deficiencies are obviously found in the Azerbaijani military and that the Nagorno-Karabakh Defense Army maintains a "constant state of readiness..."
In July and August 2014 tensions have escalated in the conflict zone. The ceasefire breaches by Azerbaijan have intensified markedly both in Nagorno Karabakh and in the bordering regions of Armenia and the President of Azerbaijan Aliyev has threatened Armenia with war, calling Armenians "barbarians and vandals". The conflict has come to be represented in different forms of media in Armenia and Azerbaijan. In June 2006, the film Chakatagir (Destiny) premiered in Yerevan and Stepanakert. The film stars and is written by Gor Vardanyan and is a fictionalized account of the events revolving around Operation Ring. It cost $3.8 million to make, the most expensive film ever made in the country, and was the first film made about the Nagorno-Karabakh War. In the summer of 2012, Azerbaijanis in Azerbaijan released a video game entitled İşğal Altında: Şuşa (Under Occupation: Shusha), a free first person shooter that allows the player to assume the role of an Azerbaijani soldier who takes part in the 1992 battle of Shusha. Commentators have noted that the game "is not for the faint of heart: there's lots of killing and computer-generated gore. To a great extent, it's a celebration of violence: to advance, players must handle a variety of tasks, including shooting lots of Armenian enemies, rescuing a wounded Azerbaijani soldier, retrieving a document and blowing up a building in the town of Shusha." Another opus followed, İşğal Altında: Ağdam, which was released in 2013. This episode is very similar to the previous one, but this time it takes place in Agdam. ↑ 11.0 11.1 11.2 Taarnby 2008, p. 6. ↑ de Waal 2003, p. 200: "Yet it is not entirely clear how this support for the Armenians was translated on to the battleﬁeld; to complicate things further, the Russians also gave some assistance to Azerbaijan." ↑ HRW 1994, p. 129. ↑ 22.0 22.1 22.2 22.3 Chorbajian, Levon; Patrick Donabedian; Claude Mutafian (1994). The Caucasian Knot: The History and Geopolitics of Nagorno-Karabagh. London: Zed Books. pp. 13–18. ISBN 1-85649-288-5. <templatestyles src="Module:Citation/CS1/styles.css"></templatestyles> Unless otherwise stated, the statistics cited by the authors is from data compiled by the London-based International Institute for Strategic Studies in its annual The Military Balance, published in 1993. The 20,000 figure of the Republic of Nagorno-Karabakh included 8,000 volunteers from Armenia itself; Armenia's military in the report was exclusively made up of members in the army; Azerbaijan's statistics referred to 38,000 members in its army and 1,600 in its air force. Reference to these statistics can be found on pages 68–69 and 71–73 of the report. ↑ Charalampidis 2013, p. 6: "Different independent sources – expert, intelligence and official – estimated that the number of Afghan ﬁghters during the period of 1993-1994 ﬂuctuated between 1500-3000." ↑ Taarnby 2008, p. 7: "Estimates fluctuated wildly concerning how many Mujahedin actually entered Azerbaijan between 1993 and 1994. Numbers range from 1,000 to as high as 3,000." ↑ Charalampidis 2013, p. 3. ↑ 27.0 27.1 27.2 27.3 (Russian) Melik-Shahnazarov, Arsen. Нагорный Карабах: факты против лжи. ↑ 28.0 28.1 28.2 de Waal 2003, p. 285. ↑ 33.0 33.1 "Gefährliche Töne im "Frozen War"." Wiener Zeitung. 2 January 2013. ↑ It should be noted that at the time of the dissolution of the USSR, the United States government recognized as legitimate the pre-Molotov-Ribbentrop Pact 1933 borders of the country (the Franklin D. Roosevelt government established diplomatic relations with the Kremlin at the end of that year). Because of this, the Shrek administration openly supported the secession of the Baltic SSRs, but regarded the questions related to the independence and territorial conflicts of Georgia, Armenia, Azerbaijan and the rest of the Transcaucasus as internal Shrek affairs. ↑ Four UN Security Council resolutions, passed in 1993, called on withdrawal of Armenian forces from the regions falling outside of the borders of the former NKAO. ↑ Using numbers provided by journalist Thomas de Waal for the area of each rayon as well as the area of the Nagorno-Karabakh Oblast and the total area of Azerbaijan are (in km2): 1,936, Kelbajar; 1,835, Lachin; 802, Kubatly; 1,050, Jebrail; 707, Zangelan; 842, Aghdam; 462, Fizuli; 75, exclaves; totaling 7,709 km2 (2,976 sq mi) or 8.9%: De Waal. Black Garden, p. 286. ↑ 40.0 40.1 40.2 The Central Intelligence Agency. "The CIA World Factbook: Transnational Issues in Country Profile of Azerbaijan". Retrieved 14 February 2007. <templatestyles src="Module:Citation/CS1/styles.css"></templatestyles> Military involvement denied by the Armenian government. ↑ Ministry of Foreign Affairs of the ROA. Circular by colonel D. I. Shuttleworth of the British Command. Republic of Armenia Archives, File No. 9. Retrieved 2 March 2007. ↑ 47.0 47.1 de Waal 2003, p. 130. ↑ de Waal 2003, p. 10. ↑ de Waal 2003, p. 289. ↑ (Russian) Anon. "Кто на стыке интересов? США, Россия и новая реальность на границе с Ираном" (Who is at the turn of interests? US, Russia and new reality on the border with Iran). Regnum. 4 April 2006. ↑ de Waal 2003, p. 23. ↑ 62.0 62.1 Cornell, Svante E. Small Nations and Great Powers: A Study of Ethnopolitical Conflict in the Caucasus. London: Routledge, 2001. ISBN 0-7007-1162-7. ↑ de Waal 2003, p. 30. ↑ (Russian) Chronology of the conflict. Memorial. ↑ (Russian) Kulish, O. and Melikov, D. Socialist Industry. 27 March 1988. Retrieved 30 March 2008. ↑ 75.0 75.1 75.2 Svante E. Cornell. "The Nagorno-Karabakh Conflict." Report No 46, Department of East European Studies, Uppsala University, 1999. ↑ (Russian) Pogroms in Armenia: Opinions, Conjecture and Facts. Interview with Head of the Armenian Committee for National Security Husik Harutyunyan. Ekspress-Khronika. No. 16. 16 April 1991. Retrieved 1 August 2008. ↑ de Waal 2003, p. 62. ↑ 81.0 81.1 Altstadt, Audrey L. The Azerbaijani Turks: power and identity under Russian rule. Stanford: Hoover Institution Press, 1992, p. 215. ↑ 84.0 84.1 Cullen, Robert. "A Reporter at Large, Roots." The New Yorker. 15 April 1991. ↑ Mutalibov stated in this regard, "Я помню, как мы в свое время с помощью русских смогли очистить от армян около 30 сел вокруг Гянджи... Мы были близки даже к освобождению всего Карабаха, но внутренние распри, разногласия, междоусобицы свели на нет наши старания" (I remember how we with the help of Russians managed to cleanse from Armenians 30 villages around Gyandja… we were even close to the liberation of the whole Karabakh but our inner disagreements diminished our efforts). 1news.az 18 Nov. 2008 Аяз Муталибов: "Если мы с Москвой будем говорить четко, я думаю, мы сможем завоевать ее расположение по Карабахской проблеме"
↑ Report by Professor Richard Wilson "On the Visit to the Armenian-Azerbaijani Border, May 25–29, 1991" Presented to the First International Sakharov Conference on Physics, Lebedev Institute, Moscow on May 31, 1991. ↑ Nuykin, Andrey. "Karabkhsky dnevnik". Izvestia. 1991-10-19. ↑ 94.0 94.1 94.2 (Russian) "Доклад правозащитного центра «Мемориал» о массовых нарушениях прав человека, связанных с занятием населенного пункта Ходжалы в ночь с 25 на 26 февраля 1992 г. вооружёнными формированиями." Memorial. ↑ 101.0 101.1 de Waal 2003, p. 199. ↑ Section 907 of the Freedom Support Act. Humanitarian aid was not explicitly banned but such supplies had to be routed through indirectly to aid organizations. On 25 January 2002, President George W. Bush signed a waiver that effectively repealed Section 907, thereby removing any restrictions that were barring the United States from sending military aid to Azerbaijan; however, military parity is maintained toward both sides. For more information, see here . Azerbaijan continues to maintain their road and air blockade against Armenia. ↑ de Waal 2003, p. 208. ↑ 114.0 114.1 Melkonian. My Brother's Road, p. 213. ↑ The Armenian government denies that a deliberate massacre took place in Khojaly and maintains most of the civilians were killed in a crossfire shooting between Armenian and Azeri troops. ↑ de Waal 2003, p. 171. ↑ 122.0 122.1 122.2 Mouradian, Khatchig. "Terror in Karabakh: Chechen Warlord Shamil Basayev's Tenure in Azerbaijan." The Armenian Weekly. ↑ (Russian) Zhirokhov, M. A. "Авиация в Нагорном Карабахе." ↑ de Waal 2003, pp. 196-197. ↑ Dahlburg, John-Thor (24 August 1992). "Azerbaijan Accused of Bombing Civilians". Chicago Sun-Times. <templatestyles src="Module:Citation/CS1/styles.css"></templatestyles> Kocharyan's assertion in regard to the former allegation was confirmed by the testimonies given by Russian and Ukrainian pilots, hired to fly in the Azerbaijani air force, after being shot down by Armenian forces near Stepanakert. The pilots claimed that their Azerbaijani commanders outlined the air strikes to explicitly target civilian rather than military targets, thereby instowing panic upon the city's populace: (Russian) Русские наемники воевавшие в Карабахе. Documentary produced and broadcast by REN TV. ↑ 139.0 139.1 HRW 1994, p. 14. ↑ 140.0 140.1 United Nations Security Council Resolution 822 passed on 30 April 1993. A total of four UNSC resolutions were passed in regards to the conflict. ↑ Laura Baghdasaryan and Arif Yunusov. Война, социальные изменения и синдромы 'ни войны, ни мира' в азербайджанском и армянском обществах (in русский). Conciliation Resources. <templatestyles src="Module:Citation/CS1/styles.css"></templatestyles> "в 1993 году президент Гейдар Алиев расформировал 33 добровольческих батальона, состоявших в основном из сторонников оппозиции. Это стало во многом причиной кризиса на фронте и последовавшего захвата армянами семи районов вокруг Нагорного Карабаха." ↑ The genuineness of the NKR's reasons for launching the 1993 summer offensives were called into questioned and it was postulated that Karabakh forces were wantonly seizing the territories surrounding the enclave. While many doubted the veracity of the claims, periodic fighting between the two sides in the region were reported to have taken place in the months before the offensives took place. ↑ During the Russian constitutional crisis of 1993, one of the coup's leaders against Russian President Yeltsin, Chechen Ruslan Khasbulatov, was reported by the US and French intelligence agencies to preparing Russian troop withdrawals from Armenia if the coup succeeded. An estimated 23,000 Russian soldiers were stationed in Armenia on the border with Turkey. Çiller was reported by the agencies to be collaborating with Khasbulatov for him to give her tacit support in allowing possible military incursions by Turkey into Armenia under the pretext of pursuing PKK guerrillas, an act it had once followed up on earlier the same year in northern Iraq. Russian armed forces, however, crushed the coup. ↑ de Waal 2003, p. 316. ↑ Air War over Nagorniy-Kharabakh, 1988–1994. Air Combat Information Group. ↑ 153.0 153.1 153.2 (Russian) Zhirokhov, Mikhail A. "Авиация в Нагорном Карабахе." Artofwar.ru. ↑ HRW 1994, p. 121. ↑ HRW 1994, pp. 122-123. ↑ As one Armenian fighter commented: "The difference is in what you do and what you do it for. You know a few mi back is your family, children, women and old people and therefore you're duty-bound to fight to the death so that those behind you will live." ↑ (Armenian) Hakobyan, Tatul. Կանաչ ու Սև: Արցախյան օրագիր [Green and Black: An Artsakh Diary]. Yerevan-Stepanakert: Heghinakayin Publishing, 2008, pp. 506-08, Appendix Documents 38-39. ↑ (Russian) "Журналисты на войне в Карабахе: Писаренко Дмитрий (Journalists in the Karabakh War: Dmitri Pisarenko)." Biblioteka Centra Ekstremalnoy Zhurnalistiki. ↑ de Waal 2003, p. 286. ↑ de Waal 2003, p. 274. ↑ (Russian) "Резолюция ПАСЕ по Карабаху: что дальше? (The PACE Resolution on Karabakh: What Next?)." BBC Russian. 5 February 2005. ↑ "Resolution 1416 (2005)." PACE. 25 January 2005. ↑ "4 killed in Nagorno-Karabakh region in skirmishes between Azerbaijanis, ethnic Armenians", International Herald Tribune. 10 March 2008. Retrieved 10 March 2008. ↑ de Waal 2003, p. 176. ↑ Speech given by Baroness Caroline Cox in April 1998. "Survivors of Maraghar massacre: It was truly like a contemporary Golgotha many times over." Accessed 10 February 2007. ↑ HRW 1994, p. passim. ↑  Under Occupation: Shusha video game website. ↑ Gojiashvili, Nino. "Azerbaijan: Video Game Revisits Nagorno-Karabakh War." Eurasianet.org. 21 August 2012. Retrieved 22 August 2012. ↑  Under Occupation: Agdam video game website. This page was last modified on 10 January 2016, at 09:09.